Commonwealth Stamps Opinion: 1052. 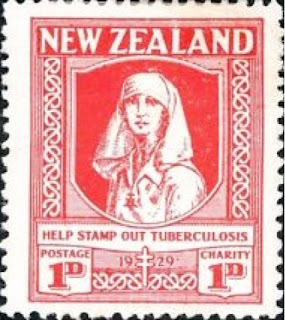 🇳🇿 New Zealand Ends Health Stamps After 88 Years. 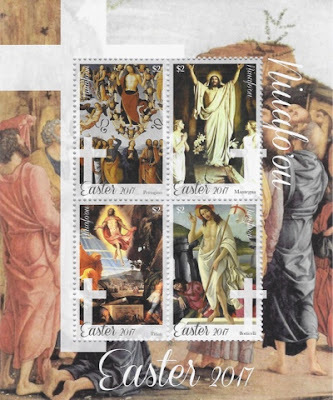 1052. 🇳🇿 New Zealand Ends Health Stamps After 88 Years. 🇳🇿 New Zealand Post has announced that it will no longer issue its annual Children's Health stamps which were first issued in 1929. 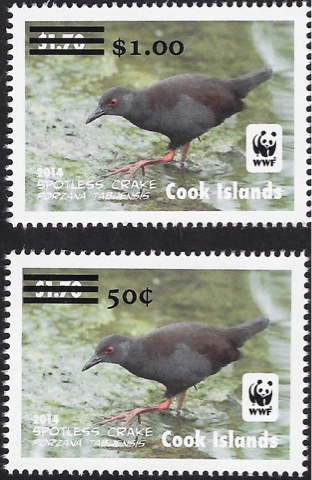 New Zealand Post has said that "In recent times, mail volumes have been in decline and this has been reflected in the number of Children's Health stamps sold. 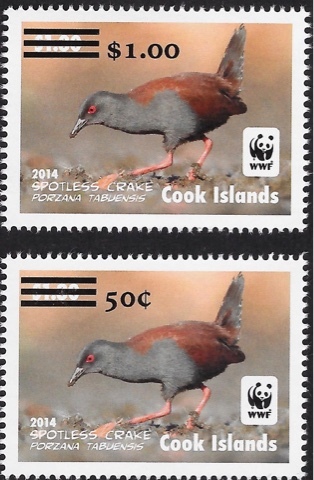 Unfortunately this has lead to it being no longer financially viable for New Zealand Post and Stand to administer this stamp issue .... As a result, this annual stamp issue will no longer be continued, however New Zealand Post will continue to support the great work that Stand does by other means. September 2016 was the last date of issue for Children's Health Camp stamps.....". 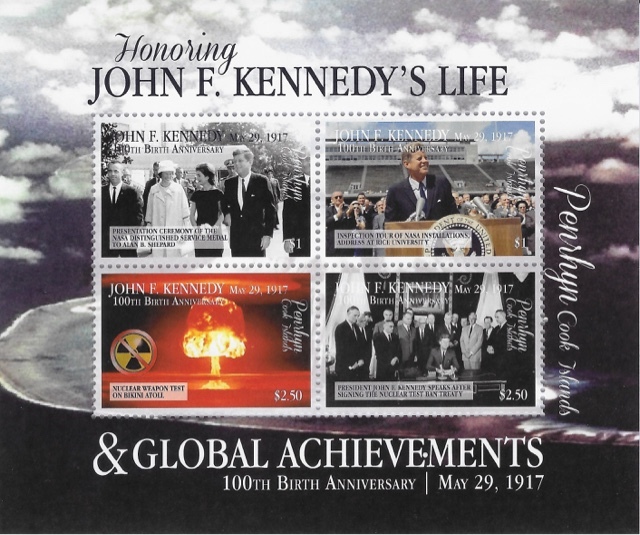 How long before it becomes "no longer financially viable" to issue new stamps of any kind? I recently mused about the non-appearance of any philatelic products from the philatelic agency Philatelic Collector Inc. so far during 2017 but now a whole host of such items has been put on to the market minus anything from Samoa one might add. There are items with the names of 2 postal services printed on them - Cook Islands and Tonga. The number of items offered for sale has been increased by producing items for parts of the territories- the islands of Aitutaki and Penrhyn in the Cook Islands and the island of Niuafo'ou which is part of Tonga. All five of these entities have had their names printed on products which commemorate Easter 2017, the 65th anniversary of the accession of Queen Elizabeth II and the Centenary of the birth of former US President Kennedy. Ho hum. 3 July 2017 - Kennedy Centenary - 1 miniature sheet- Rating:- *. 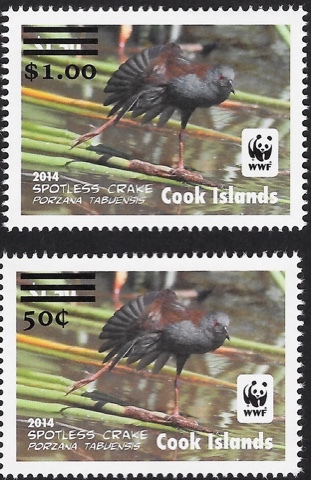 9 July 2017 - 6 Surcharges on previously issued World Wide Fund For Nature stamps - Rating:- ***. 14 July 2017 - International Year of Sustainable Tourism For Development - 1 miniature sheet containing 6 different stamps - Rating:- ****. 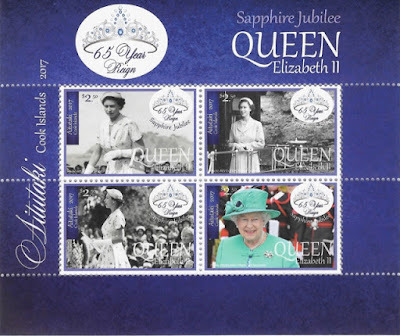 17 July 2017 - Sapphire Jubilee of Queen Elizabeth II - 1 miniature sheet of 4 different stamps- Rating:- **. 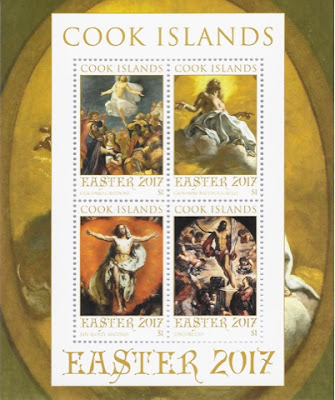 🇨🇰 Cook Islands Aitutaki - 12 April 2017 - Easter - 1 miniature sheet containing 4 different stamps- Rating:- 0. 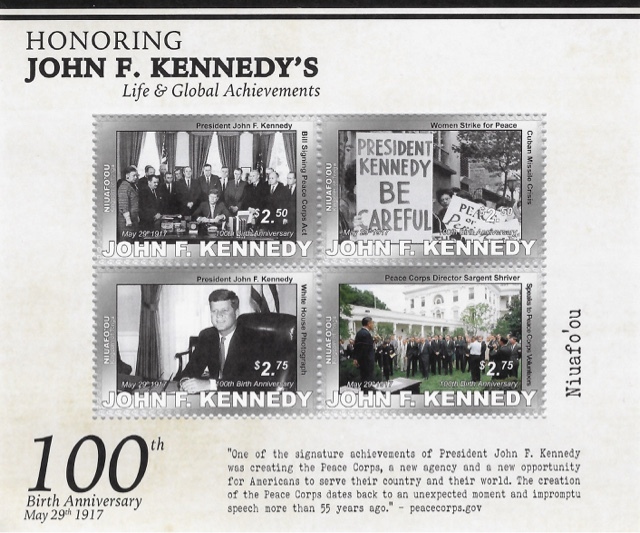 3 July 2017 - Kennedy centenary- q miniature sheet containing 4 different stamps- Rating:- 0. 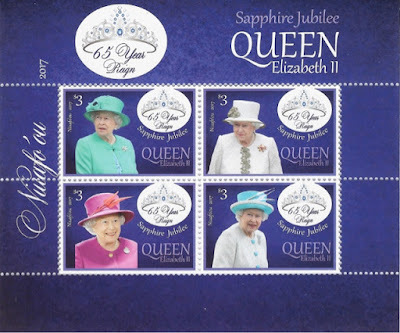 17 July 2017 - Sapphire Jubilee of Queen Elizabeth II - 1 miniature sheet containing 4 different stamps- Rating:- *. 🇨🇰 Cook Islands Penrhyn - 12 April 2017 - Easter - 1 miniature sheet containing 4 different stamps- Rating:- 0. 3 July 2017 - Kennedy centenary- 1 miniature sheet containing 4 different stamps- Rating:- 0. 🇹🇴 Tonga - 10 April 2017 - Easter - 1 miniature sheet containing 4 different stamps- Rating:- 0. 7 June 2017 - Sapphire Jubilee of Queen Elizabeth II -1 miniature sheet containing 4 different stamps- Rating:- *. 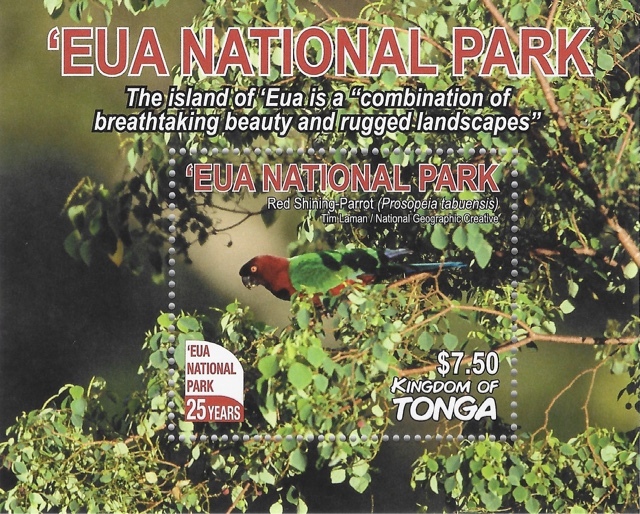 10 July 2017 - 25th anniversary of Eua Natuinal Park - a se-tenant block of 4 stamps and 1 miniature sheet - Rating:- ****. 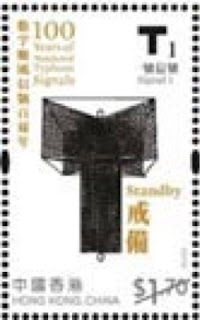 14 July 2017 - Chinese fashion - 1 miniature sheet containing 4 different stamps - Rating:- 0. 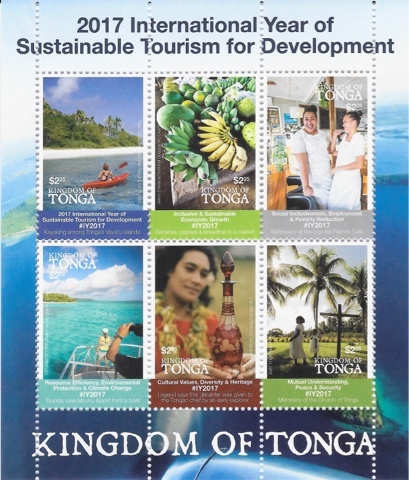 18 July 2017 - International Year of Sustainable Tourism For Development - 1 sheetlet of 6 different stamps - Rating:- ****. 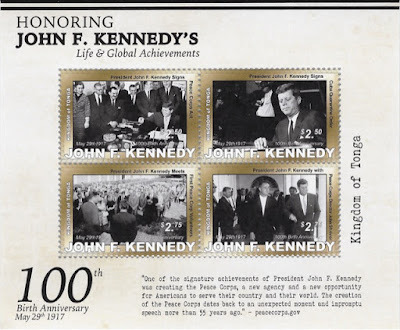 21 June 2017 - Kennedy Centenary - 1 miniature sheet containing 4 different stamps- Rating:- 0. 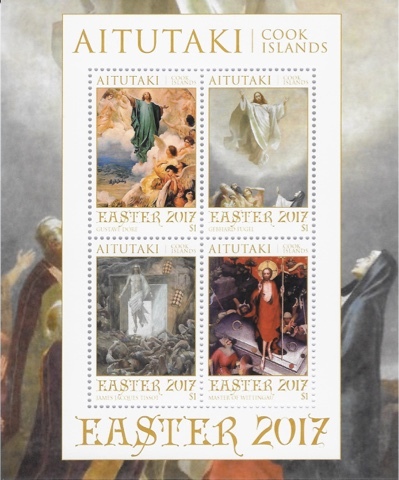 🇹🇴 Tonga Niuafo'ou - 10 April 2017 - Easter - 1 miniature sheet containing 4 different stamps - Rating:- 0. 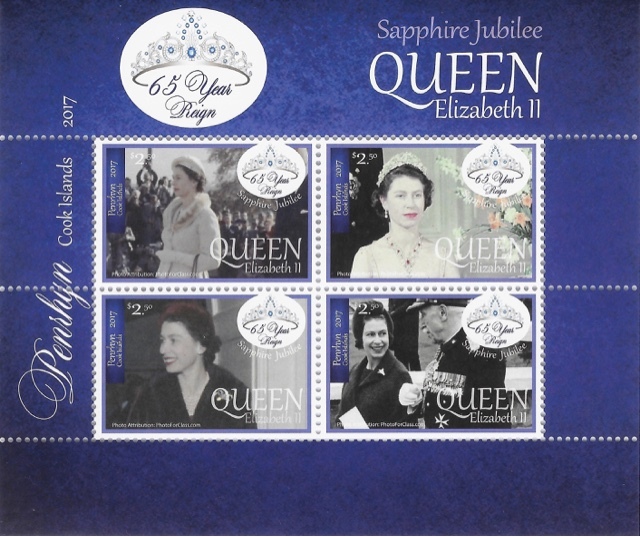 7 June 2017 - Sapphire Jubilee of Queen Elizabeth II - 1 miniature sheet of 4 different stamps - Rating:- 0. 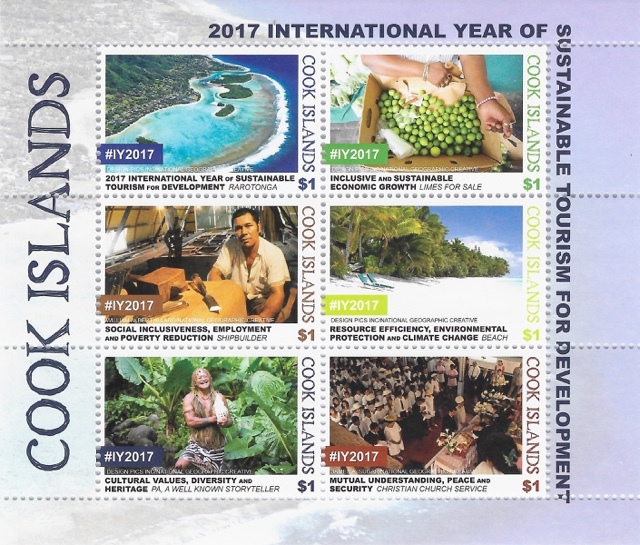 12 July 2017 - 4 stamps and 1 miniature sheet containing a single stamp - Rating:- 0. 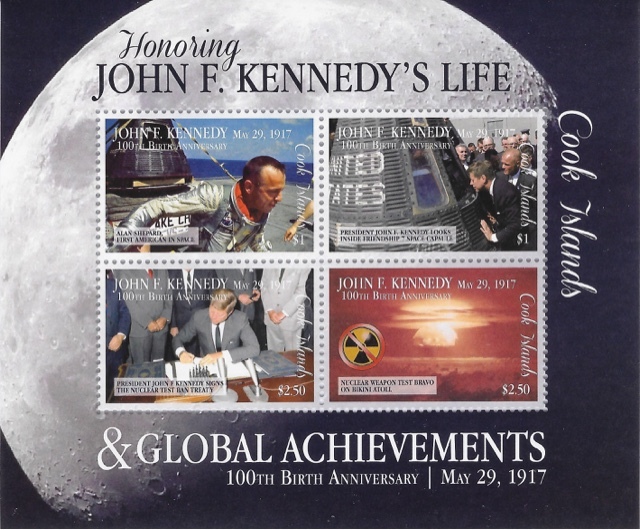 21 June 2017 - Kennedy Centenary - 1 miniature sheet containing 4 different stamps - Rating:- 0. 🇭🇰 Hong Kong Post issued a set of 5 stamps and 1 miniature sheet and 1 HK$48 Prestige booklet on 13 June 2017 to commemorate the Centenary of the use of numbered typhoon signals. 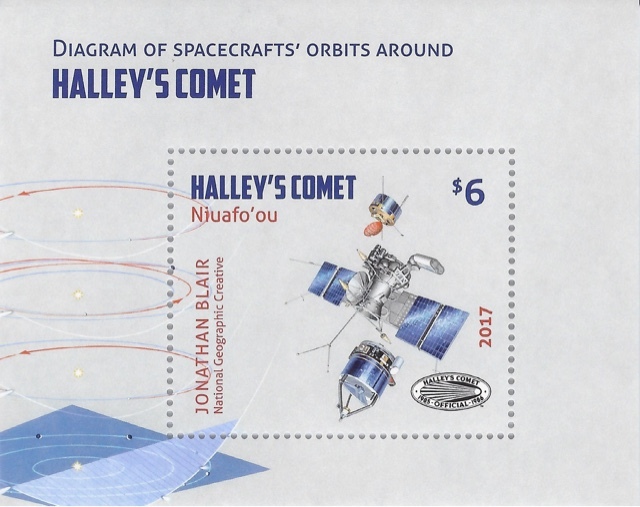 The issue was designed by Kallen Yan and lithographed by Cartor and perforated 13.5 (basic stamps) or 14.5 (miniature sheet). 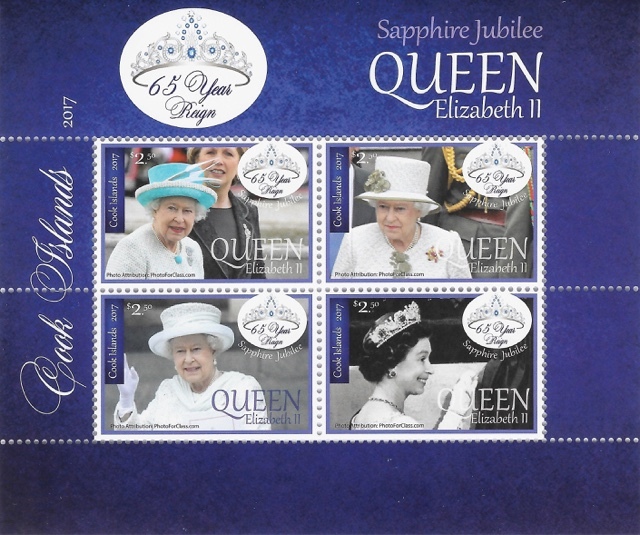 This is an interesting set which commemorates an unusual anniversary Rating:- ****. 🇵🇰 Pakistan Post issued a single stamp on 6 July 2017 to commemorate the 50th anniversary of co-operation by Pakistan with the Asian Development Bank. 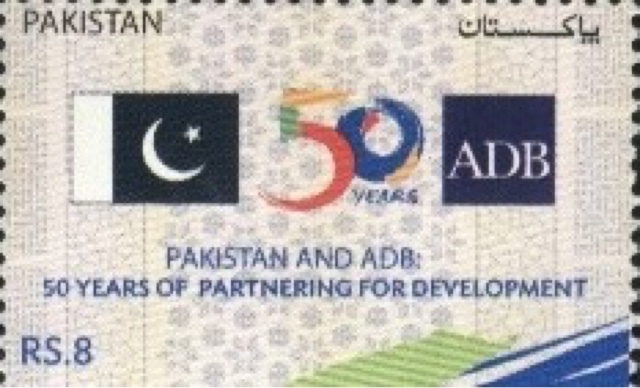 The sadly uninteresting stamp was designed by ADB Pakistan Resident Mission in Islamabad and lithographed by National Security Printing Corporation, Pakistan and perforated 13. Rating:- *. 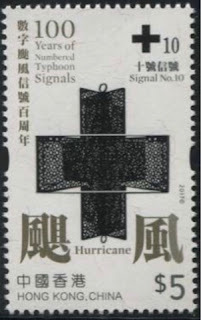 Whilst it is sad to see the end of the Health stamps, it is a reflection on the realities in which modern post offices most operate. In private conversations with Australia Post Philatelic over their stamp issuing policy I have heard about the realities that philatelic departments have to operate under. 'We have to achieve a profit' was the line that was used, and so that explains the proliferation of additional items with new issues. Yes, selling stamps does mean revenue, but that revenue needs to be held as those stamps could be used as postage in the future. 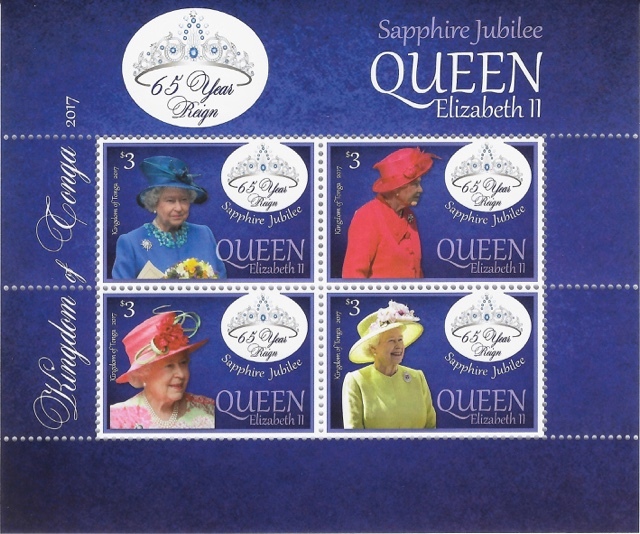 Profit margins for philatelic departments are very slim, and the cost to administer the Health stamp scheme wouldn't have been small. A sad but inevitable reflection on the world in which modern post offices must operate. "Due to extenuating circumstances surrounding Samoa Post’s failure to act within the agreed terms we have been given no other choice than to end our representation until an amicable resolution can be reached. 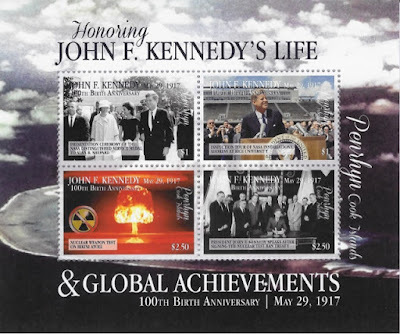 Going forward we do not have plans to offer new issue services for 2017 issues onward, though we will maintain an inventory of all prior issues offered from our company. "We apologize for any inconvenience caused by this change, we will keep you informed going forward with updates should our representation resume. If there is anything we can assist you with please let us know." Dear Chris, thank you for your 2 most recent comments. 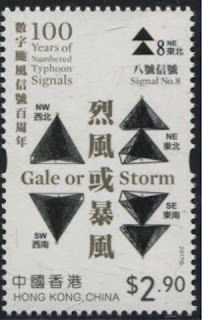 Your comment on the realities of running a philatelic department is very interesting and any sensible collector will understand that they must make a profit and that profits are probably small and that one day stamps sold for collecting purposes may actually turn up to be used for postal usage. Profits may be very small now because far fewer stamps of a particular issue are sold as more and more collectors are turned away from new issues simply because of the large number of issues being produced. 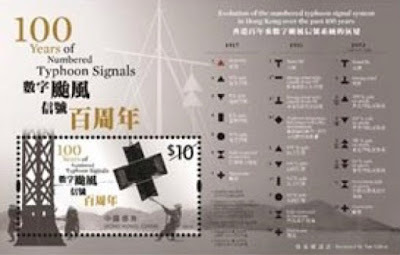 As number of stamps of particular issues purchased for collection falls so the philatelic service increases the number of issues to sell to collectors to maintain its income. 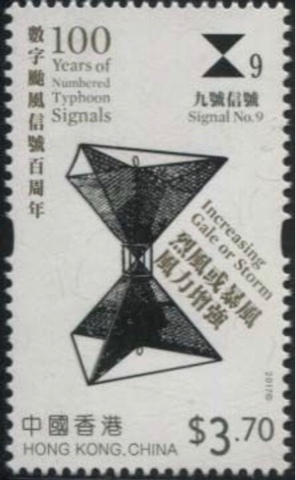 A vicious circle results in unhappy collectors and philatelic services with falling incomes. Australia Post seems to me to have got itself into such a situation. I noticed that PCI had added some new issues to its 2016 listing for Samoa and started to write the next Blog about it and then noticed you had left a comment on this. In fact the Tourism, Christmas and WWF stamps have been listed for some months but the Kennedy and Nebulae items are newly added presumably to get them on the list before the 31 December 2016 which is probably when their contract with Samoa expired. 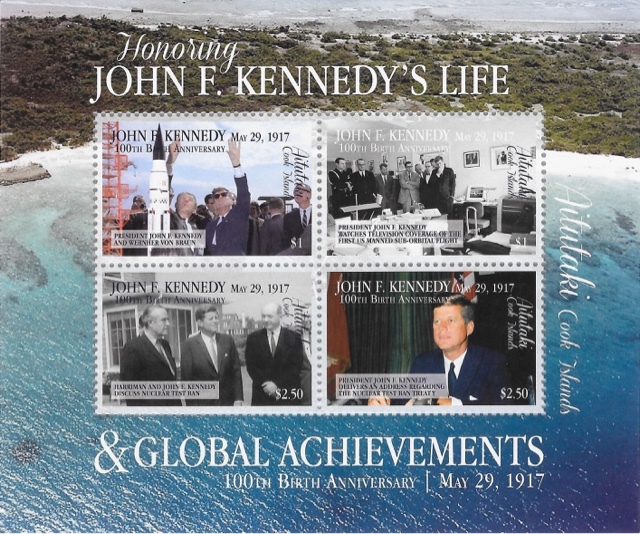 I am a little dubious as to whether these stamps were actually placed on sale in Samoa itself before 31 December given that the Kennedy stamps for all PCI's other clients were not issued until mid-2017. It's a mystery to me as to why Samoa would issue stamps depicting nebulae. Selling 5000 copies of 10 different sets is less profitable than selling 10000 copies of 5 different sets because for each issue there is an overhead (design costs and other overhead) that is independent of the number of stamps produced and sold. 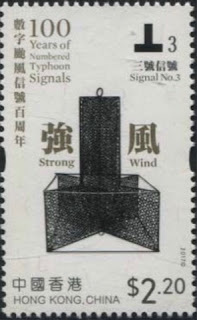 1050. 🇬🇩🇬🇾 Daft Or Desperate? 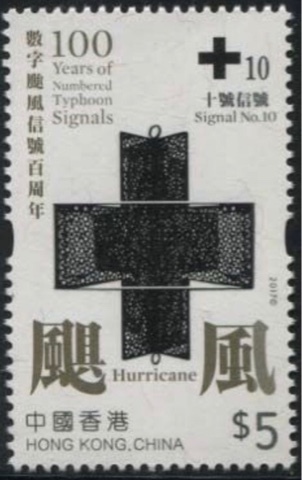 1049. 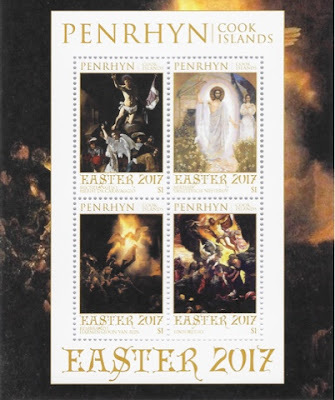 🇬🇬 Guernsey Commemorates Local Regiment. 1045. 🇵🇳 Pitcairn Issues Marine Life Sheetlet. 1042. 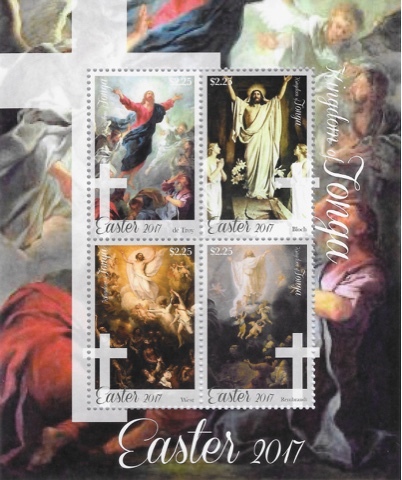 🇬🇧 Local Stamps In Demand. 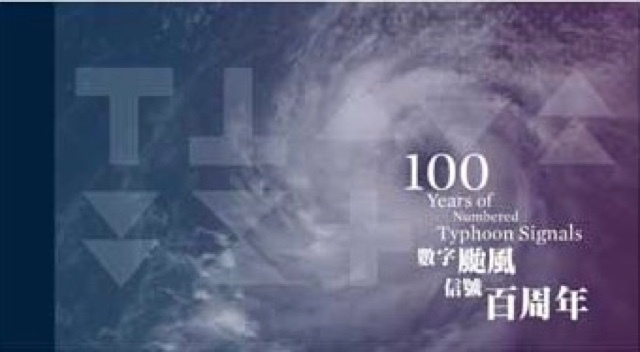 1039. 🇿🇦 New South Africa Issue Depicts Bees.